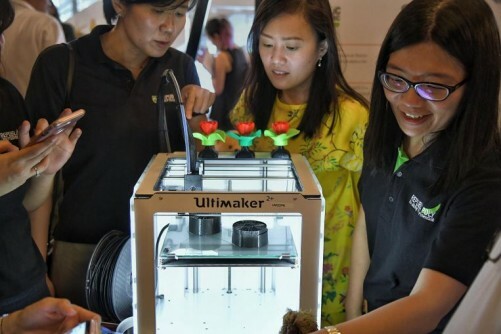 The SkillsFuture Series of bite-sized courses, which are now available for sign-ups, will aim to train 10,000 Singaporeans in its first year through courses that last for an average of 25 hours each. This will be ramped up to 50,000 training places a year by 2020, with total annual continuing education and training hours under the series to grow to 2.2 million hours from 440,000 hours now. This initiative was announced by Education Minister (Higher Education and Skills) Ong Ye Kung at the launch of the Lifelong Learning Festival at the Devan Nair Institute for Employment and Employability on Saturday (Oct 28). SkillsFuture Singapore (SSG) expects to spend more than $70 million over the first three years of the scheme. Speaking at the event launch, Mr Ong said that insititutes of higher learning (IHLs) account for just 8 per cent of total continuing education and training delivery currently, if academic programmes like Master's courses are excluded. "It is a pity, given the tremendous delivery capability of IHLs. But it is also understandable, because continuing education and training has never been the remit of IHLs, whose primary mission is to educate students." But that has changed today, he noted, given the restructuring of SkillsFuture Singapore under the Ministry of Education, with continuing education and training forming part of the expanded mission of IHLs. The universities, polytechnics and Institute of Technical of Education will offer the bulk of the courses under the series, more than 400 of which are currently available for immediate enrolment. This course list will be continually expanded by up to threefold. The institutions will each be assigned with a specific sector, and take the lead in ensuring that there are adequate training places and programmes available to meet industry needs in these sectors, namely data analytics, finance, technology-enabled services like e-payments solutions, digital media, cybersecurity, advanced manufacturing, entrepreneurship, and urban solutions. For example, the National University of Singapore will offer data analytics courses in areas like artificial intelligence and cloud computing, while both Temasek Polytechnic and the Singapore University of Technology and Design will be tasked with leading courses in cybersecurity. These sectors draw reference from the Industry Transformation Maps, which will be rolled out for 23 sectors, as well feedback from industry players. They are tiered across three proficiency levels: basic, intermediate and advanced, allowing them to cater to both career-switchers and those looking to acquire deeper knowledge. About a fifth of the total suite of courses will be offered by "high-quality" private training providers, such as Singapore Media Academy. Singaporeans and permanent residents can get up to 70 per cent subsidies on the courses, which run for an average of 25 hours. They are offered at three levels of intensity - basic, immediate and advanced, so that those with or without industry experience will be able to enrol in them, and progress through the levels. After subsidies, the bulk of basic level training courses will cost less than $500. The institutions will continue to offer other continuing education and training programmes that do not fall under the SkillsFuture Series or the identified sector that they have been tasked to take the lead in. However, the Ministry of Education (MOE) faces the reality of "a finite budget and the need for prioritisation", said Mr Ong. The MOE will review the funding and delivery arrangements of Masters programmes at the autonomous universities. For example, those that are more skills-based could be delivered in a modular system. Funding levels for coursework which are purely academic in nature could be relooked. These changes will kick in no earlier than 2019. "The IHLs are all keenly aware that this is a major transformation for their institutions, but a necessary one, in response to the challenges of our time. In pushing for CET (continuing education and training), there is also a great opportunity for IHLs to better synergise research and teaching," said Mr Ong. SSG chief executive Ng Cher Pong said that the institutes of higher learning will "add diversity to the overall continuing education and training landscape". "Over time, (they) will become an important third pillar, complementing the important roles played by employers which provide in-house training and private training providers." For more information on the courses, please visit skillsfuture.sg/series.